N-Vision X-50 X-50 Thermal Eye Thermal Imaging Camera FREE SHIPPING! Lack of light will not affect mission success while using the X-50 Thermal Eye Thermal Imaging Camera from N-Vision. Lightweight and able to slide into a pocket, the new X-50 is made for mobile operations. Featuring a ruggedized construction to match its mobility, the camera can be dropped, kicked slammed and even submerged under water and still maintain complete functionality. Its ergonomic body is easy to grip and can be pulled out of the pocket quick as a flash. Unlike other models, N-Vision's camera is not effected by changing light conditions, flares, flashes and sudden shifts in lighting. This allows users more effectively perform surveillance in virtually any situation. Capable of detecting human activity from over 1,000 feet, this camera will forever change the way your team performs night time missions. 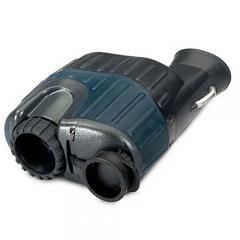 ©2002-2019 CopsPlus.com: N-Vision X-50 X-50 Thermal Eye Thermal Imaging Camera FREE SHIPPING!